How making small changes to your lifestyle and daily habits can have a big influence on your physical and mental wellbeing. Losing weight is a major life change, when you really stop and think about it. It affects the way that you carry yourself, how you view your body, the types of clothing that you wear, and your daily dieting and exercise habits. When you consider all the ways that losing weight influences your life, it makes sense that there are other aspects of your life that would have to change, as well. A lot of times, it is the little habits that we adopt that have the biggest influence on our ability to stay healthy. For example, how you spend your free time can really determine how often you decide to eat, what you have for snacks, and how often you exercise. Spending time with friends is wonderful, but if you and your friends tend to sit by the TV and snack all day, then you may need to make some changes to your social life if you hope to maintain your healthy weight level after your medical weight loss program in Los Angeles. Getting involved in your community is a great way to make healthy changes to your lifestyle while simultaneously giving back and helping others. When you get involved with a volunteer organization, you are giving yourself the opportunity to meet new people and to learn new skills. Becoming involved in your community by working on different projects can let you get to know the new healthy version of yourself. 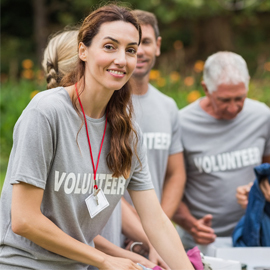 What’s more, there are actually a lot of volunteering opportunities that will actually get you on your feet and active. Sign up with the local habitat for humanity chapter and learn construction skills while putting your strength to the test. Become a mentor through Big Brother, Big Sister and get active with kids who are in need of support. Help spruce up the neighborhood with a local environmental group and get on your feet to clean up beaches and local parks. Get involved with local charities by participating in sponsored 5k races. If you aren’t up for running or walking in the race, help hand out water or organize the event. Being around runners at large races can be really inspiring! These are just a few suggestions as to how you can get involved in the LA community as you focus on getting healthier and losing weight. Filling up your schedule can help reduce those mindless hours in front of the TV, where you may be a bit too tempted to snack. If you are looking for something new to do, reach out to a local charity group and see what’s going on.